The Illinois Tollway "Oasis" restaurants are unique highway rest areas built on bridges over the roadway, accessible to people traveling in both directions. Most of them are in the Chicago area. The original five Oases were built in 1959 by Standard Oil of Indiana (Amoco), on land leased from the Tollway Authority. The architect was PACE Associates, which stood for "Planning, Architecture, and Civil Engineering". The two photos above are from old postcards. The second one was also used on various souvenir items, including the backs of playing cards, ceramic plates (several designs), and even cigarette lighters. The restaruants were originally run by the Fred Harvey organization, but in 1975 they were taken over by Howard Johnson, who remodeled the interior and added their distinctive orange roofs. Click here to see some comments from a former Howard Johnson employee. The Oases were extensively remodeled in 1984 when the fast food chains took over from Howard Johnson, and Mobil replaced Amoco. The two oases on the Northwest Tollway (I-90) were run by McDonalds, while the four on the Tri-state (I-294) alternated between Wendys and Burger King (plus Popeye's Chicken at Lincoln, and Connie's Pizza at O'Hare). The gas stations were also rebuilt, with full canopies and a much smaller building between straight rows of pumps. The Oasis buildings are currently being torn down and rebuilt. The contractor is Wilton Partners of Los Angeles, and the lease will be for 25 years. The computer rendering above is from a poster displayed at the oases just before and during the construction. Mobil will continue to run the new gas stations, which will include a convenience store and a carwash (these have already been built at all locations except Hinsdale). 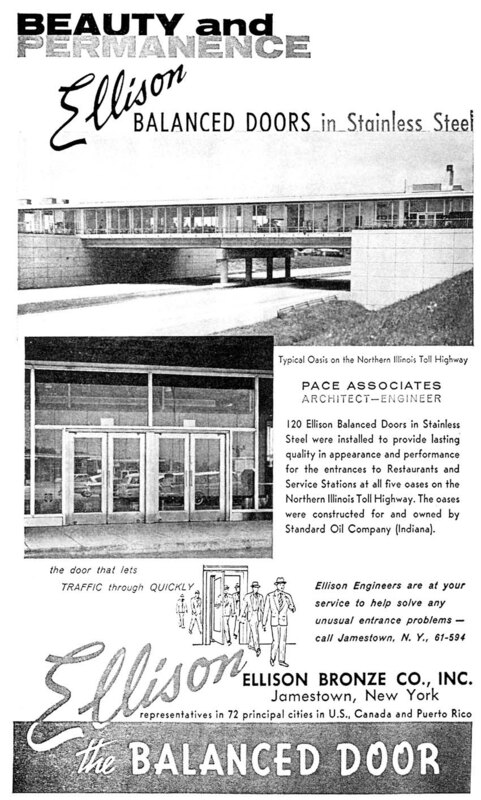 The five original Oases had heavy stainless steel entrance doors made by the Ellison Bronze Company. This photo is from an ad they placed in an architecure magazine at the time (see the entire ad here, thanks to Rich Kummerlowe for providing this scan). Note the 1950s cars reflected in the glass, and the gas station behind them to the left. These doors had unusual hinges that allowed them to pivot inward as they swung out, so they ended up next to the door jamb instead of swinging out from it (see sketch). This is supposed to make them easier to open in windy conditions, or when there are air pressure differences between the inside and outside of the building. Unfortunately it also prevents them from opening wider than 90 degrees, which surprises some people who expect them to open wider. This type of door was first designed in 1928, and is still in production. 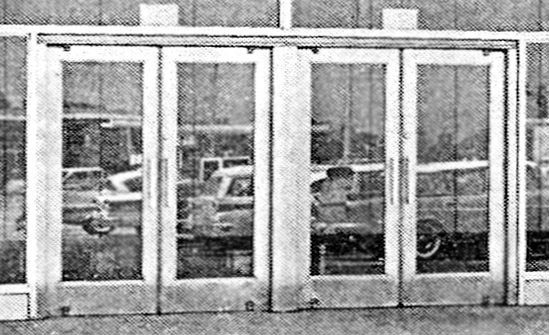 All of the main entrance doors at the Oases were eventually replaced with modern aluminum doors, which were much lighter than the original stainless steel ones and had normal hinges. Most of the original side doors remained (these were back entrances to the restaurants, and many of them were no longer used). The Lincoln Oasis, built in 1967, with a completely different design. Vinita Oklahoma, the only other over-the-road rest area in the US. A seventh "oasis" was built near De Kalb in 1972 (now run by McDonalds), but that one sits at ground level next to the roadway, with a ramp over the highway for access from both directions. It doesn't look anything like the other Oasis buildings. There is also a McDonalds in the median on the Chicago Skyway, which is owned by the City of Chicago and is not part of the Tollway (it looks just like any other McDonalds building). The Skyway has been deteriorating for years, but is now being reconstructed. I've been told that there are quite a few over-the-road rest areas in Italy and France, and a few in Germany, but I don't have photos of any of them. In the US, there are quite a few rest areas built in the median, but they are all at ground level. One in New York has parking areas next to the highway with pedestrian bridges to a building in the median. Oasis page from the official website. Listing of services at each oasis (these are being kept up to date as the reconstruction continues). PDF Map of the oasis locations (requires Adobe Acrobat plugin). There are several websites about Fred Harvey (who died in 1901), but none of them mention the oases. On the Friday before Memorial Day weekend in 1979, an engine fell off a DC-10 that was taking off from O'Hare airport (American Airlines Flight 191). The plane crashed in a field about 1/4 mile from the DesPlaines Oasis, between Touhy Ave and the Tollway. The runway points almost directly toward the Oasis. The plane was headed for Los Angeles, and had a full load of fuel. Two movies have scenes that were filmed at the oases. "The Blues Brothers" has a scene that takes place in the parking lot of the DesPlaines Oasis (with Carrie Fisher and the flamethrower). "Thief", starring James Caan, has a scene that is supposed to take place in the dining room of the O'Hare Oasis (it was actually filmed in the hallway on the opposite side of the building, next to the windows). Each oasis has hidden access roads on each side, which are used for deliveries to the restaurants. There is a small employee parking lot just outside the gate. I've heard that the gates are often left unlocked, and are occasionally used to avoid tollbooths. The northbound entrance to the Hinsdale oasis is combined with the on-ramp from I-55, so you have to "exit" twice. This extra ramp was built in the 1980s, because otherwise traffic exiting to the Oasis would have to cross traffic entering from I-55.